LIVERPOOL, U.K. – Adlib supplied lighting and sound equipment and crew for American singer/songwriter and musician Ray LaMontagne’s recent “Just Passing Through” acoustic tour. 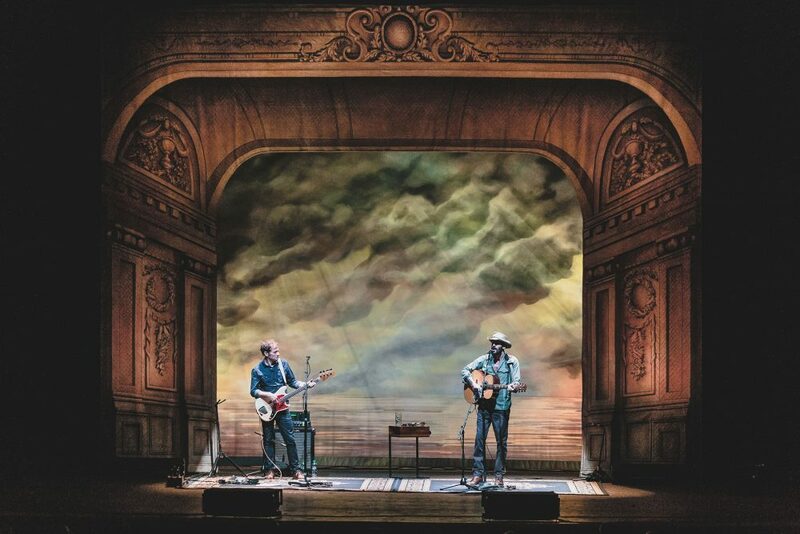 Liverpool UK based rental and production specialist Adlib supplied lighting and sound equipment and crew to the recent “Just Passing Through” acoustic tour by American singer / songwriter and musician Ray LaMontagne. The UK dates saw the artist get up close to his fans in an intimate touring environment, joined onstage only by Wilco bassist Jon Stirratt. It’s the first acoustic tour by LaMontagne for seven years and has been extremely successful. The production team was led by well-respected production manager Mark Jones. Adlib provided an L-Acoustics K2 sound system with system tech Mike Thorpe and the lighting rig was looked after by Adlib’s Kevin Byatt. 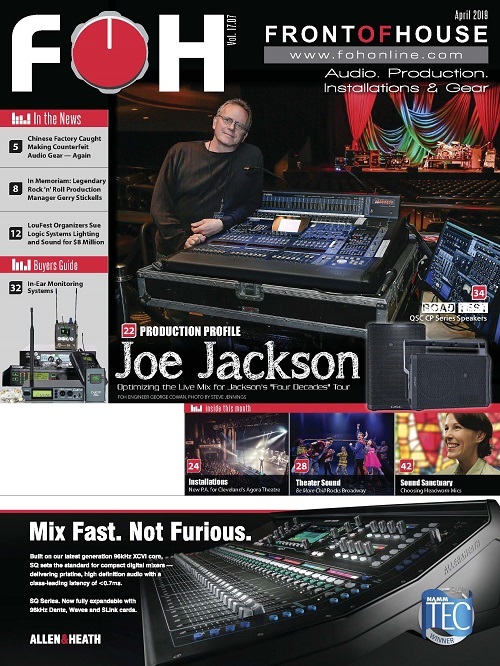 The K2 was actually specified by Mark Jones and LaMontagne’s FOH engineer Ryan Pickett was very happy to go with that decision, “It’s such a smooth and ‘musical’ speaker and that’s why Mark chose it and why I love it so much,” said Ryan. The K2 also gave him and Mike the consistency they needed venue to venue, which was a mix of theatres and Apollo style rooms. The average setup featured 10 or 12 x K2 elements flown left and right, with two KS28 subs a side on the ground, together with some Kara and ARCS which were used as front & side fillers primarily for the stalls downstairs. Some of the theatre venues had three balconies, so the challenge was to get the sound up and right into the far corners of these elusive recesses. Technically a ‘semi-acoustic’ show, a clean, high clarity but warm sound was essential, and the K2 driven by L-Acoustics 12XT amps provided plenty of volume and range, so they barely had to tickle the subs! Ryan explained that Ray’s music leans towards a more organic roots genre with a core that is “delicate and sweet” to the senses, so all of this is uppermost in his ears when getting the precise required sound. Each day they used Soundvision plus all the tools in the L-Acoustics Network Manager software to analyse and tweak the system for the space and optimise the design. 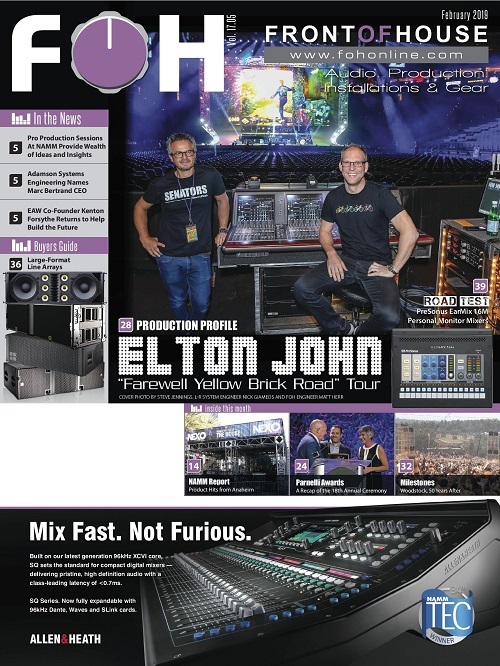 Ryan specified an Avid Profile console, while monitor engineer Rob Elliot used a DiGiCo SD12. It was an extremely clean stage as both artists utilised Sennheiser IEMs. LaMontagne is also mid-way through a full band ‘electric’ tour in the US, and using the Avid Profile for this acoustic section, Ryan needed to add some tone shaping to the equation! This came in the form of a couple of Summit DCL200 compressors, one across LaMontagne’s acoustic guitar and vocal and the other for Siratt’s backing vocal and fender Mustang bass guitar. 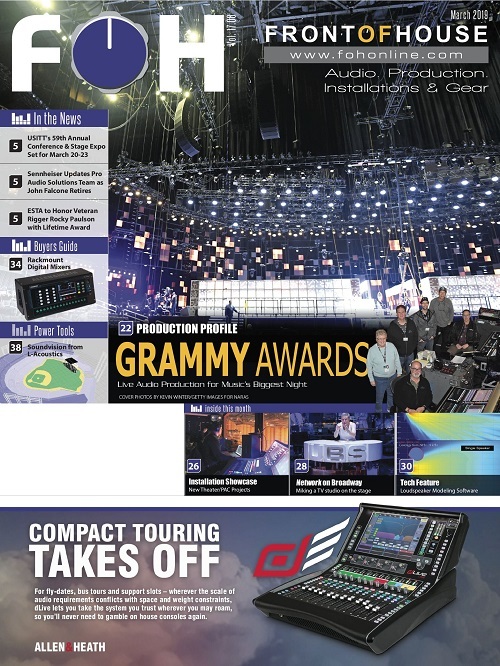 He chose a Smart C2 stereo compressor for the mix bus which provided the final stage of levelling on the mix. 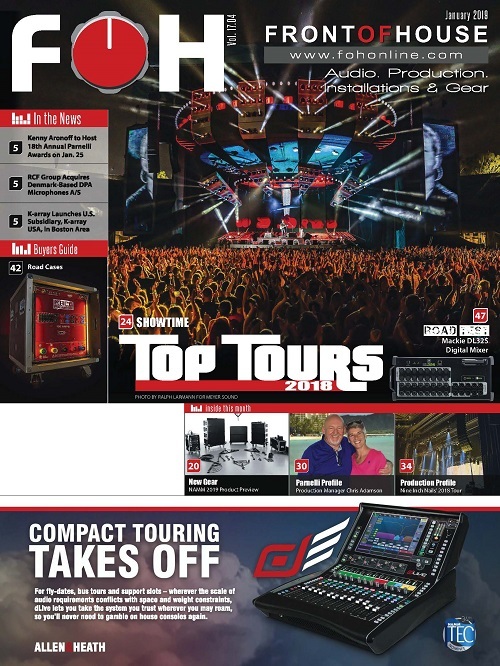 “The C2 is fast and adds an obvious amount of weight and speed to the sound,” he commented. He also used the Rupert Neve 5045 primary source enhancers on the lead and background vocals to give him control in reflective environments and allow him to focus on more gain and less feedback when boosting some of the more critically sensitive parts throughout the show. He used a Mercury M7 reverb pedal on both of the lead vocals commenting, “it has a lovely long tail and sounds very expensive for a stereo guitar pedal”. Creatively, the goal for the audio was “to provide the audience with a visceral yet cinematic experience”, which is a fine balance between Jeremy Roth’s sculpted scenic design and “Ray’s incredible voice”. The ultimate goal is for the sound to envelope the audience so they become one with the entire production. Ryan has worked with Adlib a few times over the years including on Flight of the Concords and My Morning Jacket, and was very pleased to be back on the road with them in the UK. “Mike is very knowledgeable, thorough and thoughtful in his process” he says acknowledging Mike Thorpe’s renowned meticulous attention to detail. Jeremy Roth has been a lighting professional since the 1990s and now concentrates on touring and art installation work with light and other visual media. He joined the Ray LaMontagne team in the fall of 2017 after LaMontagne saw one of his shows for Wilco. 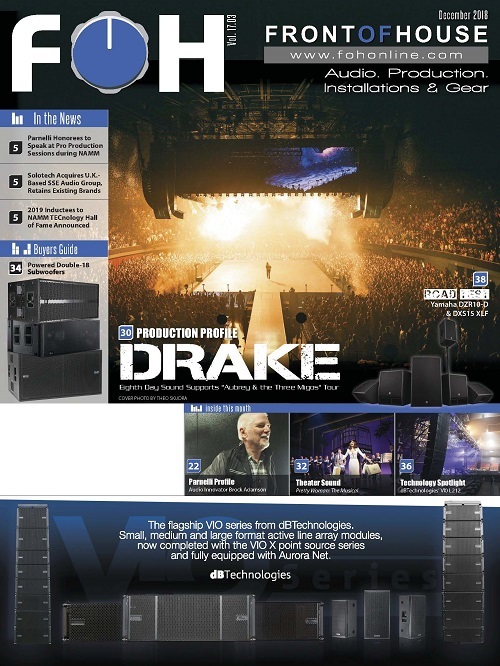 The design for this UK tour – his first with Adlib – was a continuation of last year’s acoustic tour, with the main parameters being that the rig needed to fit into a bus trailer for the US legs! The initial spark for the design – apart from creating a cosy and accessible space for an acoustic performance – came from a series of sketches that he and LaMontagne liked depicting a multi-layered cardboard cut-out of a theatre diorama, similar in style to Terry Gilliam’s 2009 fantasy film, “The Imaginarium of Dr Parnassus”. The design is comprised of three layers with a downstage portal acting as a proscenium to help draw the audience in and towards the two performers in the centre, particularly when they are playing large rooms with their own large architectural prosceniums. Their own proscenium is a hand-painted muslin drop giving an illusion of depth with a cut-out portal. Upstage of that is a hand painted cloud / sun ray scrim, and the third layer is a muslin backdrop painted with clouds giving the impression of a recent sunset over the ocean. All of this was drawn by scenic artist Valerie Light based on art direction from Jeremy and Ray LaMontagne himself. The fabrics and surfaces were sourced from Rose Brand and hand painted by Cobalt Studios and Infinite Scenic. While the set remained physically static throughout the show, the lighting transformed the look of the space from song to song. Moving light fixtures – 4 x Robe BMFL Spots and 4 x Martin MAC Quantum Washes – were concealed behind the portal and downstage legs and used to project custom gobo patterns onto the scrim and backdrop. “One of the nice aspects of this acoustic show is that the audience does not actually see any lights and you can’t really make out defined gobo patterns. It all just blends seamlessly into an artwork emphasizing different moods, highlights, colours and textures on the visual canvass,” explains Jeremy. Other fixtures on the rig were minimal – 8 x MAC Aura LED washes, a Claypaky Mythos2 and two GLP X4 Bar20s – however Jeremy made all of these work hard and go a long way! In some looks the sky and sun rays on the scrim popped out with the ocean behind gently rolling in a hazy glow – an effect created by viewing through the scrim rather than actual haze, of which there is none! In others, the scrim was transformed to near transparent with the backdrop lit to show the sun / moon setting or rising over the ocean. Each song has its own look, and only in a handful on numbers could you actually see lighting change during the song, every shift skilfully crafted to be understated and elegantly supportive of the musical intricacies.